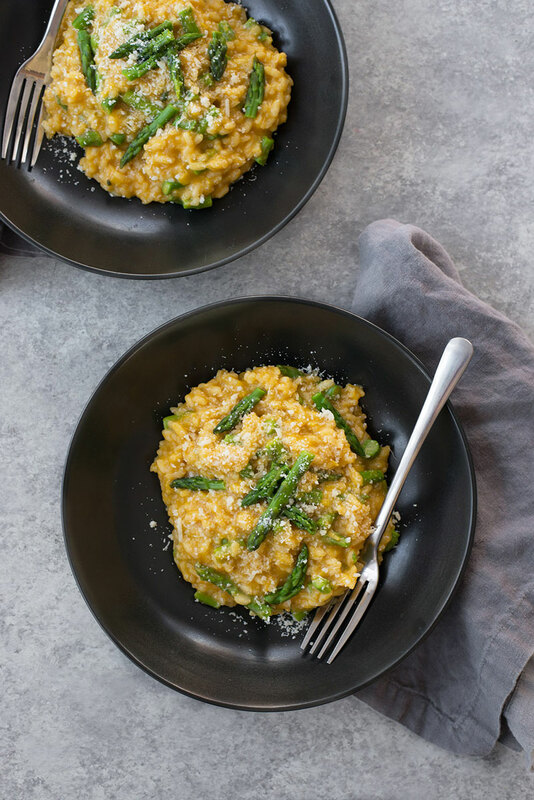 In celebration of our first ever asparagus harvest, we asked Alex Caspero, Registered Dietitian, yoga teacher and blogger at Delish Knowledge to create a delicious spring inspired recipe for us highlighting our first homegrown crop of the year. I think of asparagus as the quintessential spring vegetable. Maybe it’s because asparagus looks similar to budding flowers in the garden after a long, cold winter, or its fresh, crisp taste which reminds me that bountiful produce is on its way! 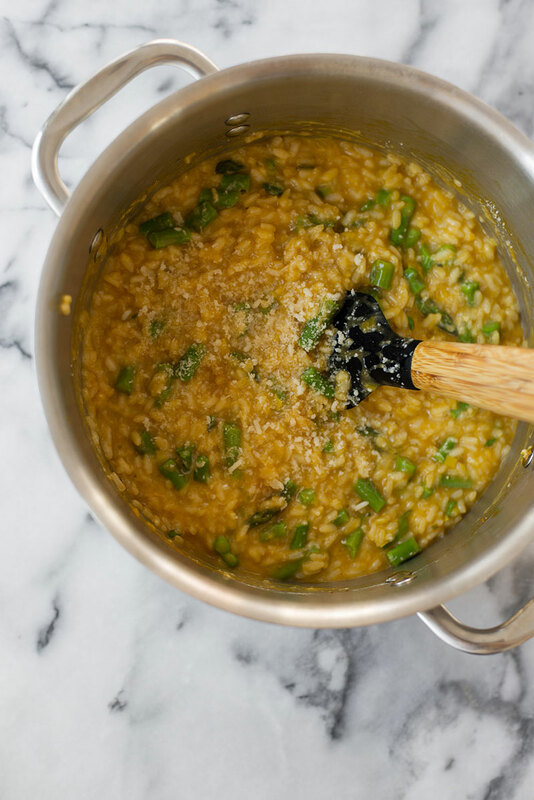 This recipe for asparagus risotto is as gorgeous as it is delicious. I know that risotto can take a bit more active time in the kitchen than other pasta recipes, but don’t let that deter you. I like to think of making risotto as therapeutic. I’ll pour myself a glass of wine, put on a podcast and let go of the day’s stress as I stir. Creating an enjoyable environment while you cook can make meal preparation a positive experience, and you’ll have a delicious bowl of risotto as a reward! If you haven’t cooked with leeks before, you are in for a treat. Leeks are a member of the onion family and add a delicate flavor to any dish. However, leeks can hold onto soil and dirt in their individual layers, so you’ll want to ensure they are very clean before adding them to the risotto. To do this, I like to run water in my sink until the leeks have enough room to float a few inches above the bottom. Trim the tops and bottoms, place in the sink and separate the layers with your hands to remove any logged grit. As you clean the leeks, the dirt will fall to the bottom and the leeks will float. Once clean, take out the leeks and pat dry. When picking out your perfect bundle of asparagus, look for vibrant stems with tight buds. Turn the asparagus upside-down and look at the stems. Dry, splitting ends signify that they are past their prime. Thick or thin stems? That’s a personal preference. Thinner stems will be more tender and mild in flavor, whereas thicker stems have a strong taste and are slightly meaty. Blanch asparagus in a pot of boiling, salted water until crisp-tender, roughly 2 minutes. Drain and transfer asparagus to a bowl of ice water to cool, then drain again. Set aside. Bring broth to boil in a medium saucepan. Reduce heat to low, cover, and keep warm. Meanwhile, melt butter and olive oil in a large saucepan over medium heat. Add leeks and sauté until tender, about five minutes. Add garlic and spices and cook until fragrant, about 1 minute. Add rice and stir for two minutes, taking care not to have the garlic or rice burn. Burnt garlic will ruin the entire dish. Add wine and simmer until absorbed, stirring constantly, about five minutes. Add ½ cup of vegetable broth. Reduce heat to medium low and simmer until absorbed, stirring frequently. Add remaining broth, ½ cup at a time, allowing broth to be just absorbed before adding more and stirring frequently until rice is just tender and mixture is creamy. The entire process should take about 30 minutes. Add asparagus and stir until heated through, about 2 minutes. Remove from heat. Stir in parmesan and parsley. Season with salt and pepper, as needed, and serve.